Due to some design problems with the calculator it took until February 2008 before the TI-34 MultiView arrived together with the TI-Collège Plus finally in the store shelves. Don't miss one of the pre-series TI-34 MultiView. Dismantling the TI-34 MultiView reveals a pretty common construction with two printed circuit boards (PCB's). The main PCB hides the single-chip calculating circuit under a small protection blob of black epoxy and drives the graphing display with a heat sealed fine-pitch connector. The keyboard makes use of a much simpler second PCB and a heat sealed connector, too. The featured calculator was manufactured by Nam Tai Electronics, Inc., a well-known company with OEM calculator production facilities in Shenzen, China. Stokes Publishing Company, Inc. based in Sunnyvale, California sold a companion for the teacher, view the wonderful TI-34MV MultiView Overhead Calculator. To reduce theft of school-owned calculators, Texas Instruments introduced the EZ-Spot Teacher Packs with a bright, easy-to-spot, "school bus yellow" back cover and slide case. In In addition, each unit's faceplate is inscribed with the words, "SCHOOL PROPERTY." Don't miss the battery powered TI-30XB MultiView and its solar-cells operated sibbling TI-30XS MultiView sold since July 2007. 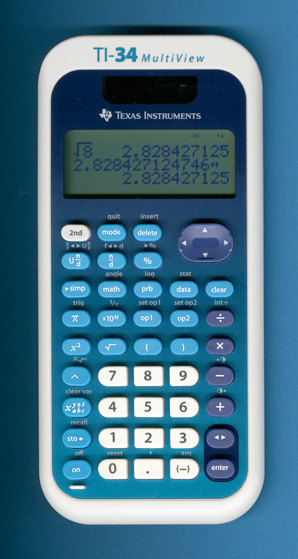 In 2013 the original TI-Collège Plus was replaced with the TI-Collège Plus Solaire and uses an identical design with the TI-34 MultiView. © Joerg Woerner, April 22, 2008. No reprints without written permission.